Summer Eats Series Part 5: Fresh Picked Desserts. 1. 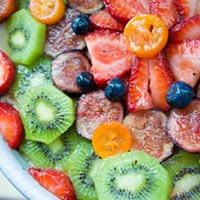 Healthier Fruit Tart. Fresh summer fruit artfully laid upon a firm vanilla pudding. Light graham crust. Cinnamon accents. Vegan. 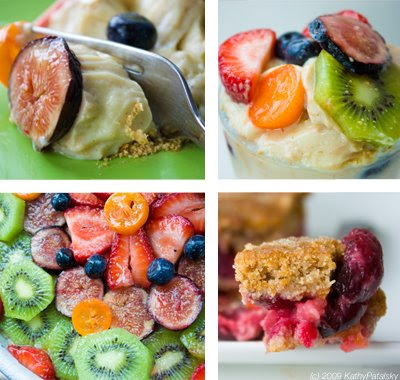 *healthier than traditional Fruit Tart desserts. Contains healthy protein-rich tofu. Fresh summer fruit. Agave and raw sugar sweetened. Healthy vegan crust. 2. 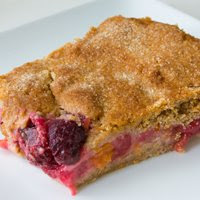 Cherry Apricot Pie Bars. Fresh picked summer cherries and apricots sandwiched between a moist spelt flour crust. *Healthier than traditional summer fruit pie. Fresh, ripe fruit. The crust is free of white flour, eggs, butter and shortening. Vegan. Organic ingredients preferred.